Stay in an iconic and historic hotel in New York. 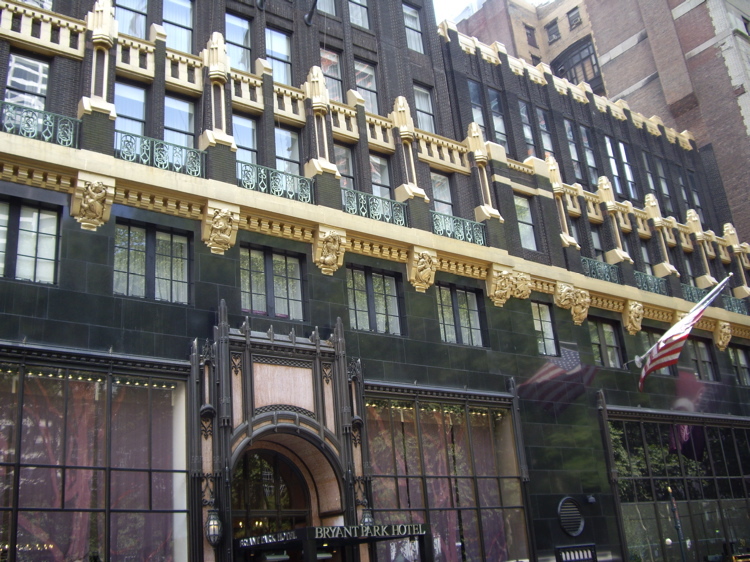 The Bryant Park Hotel is in an extremely unusual structure that was originally named the American Radiator Building. It has an interesting creative history as it was based on a design by Finnish architect Eliel Saarinen as an entry in the competition to create a new building for the headquarters of the Chicago Tribune in the early 1920s. Saarinen’s entry was not the winning one but the design was to influence several important building during the next few years. Many experts though believe that Saarinen’s was the best design of the 250 plus entries. However it wasn’t until 1998 that the building was converted into the Bryant Park Hotel. It is a pricey hotel, as you would expect from it’s location but offers fabulous amenities to its guests including free wifi, a restaurant and bar, a 24 hour health club plus quality bedding. Added extras include dry cleaning service, valet parking, limo service and more. The decor is gorgeous. See the video below. SEE PHOTOGRAPHS AND REVIEWS HERE.